For Melissa Hotchkiss, going on a hike with her Shar-Pei mix, Jesse, took the bite out of meeting new people. 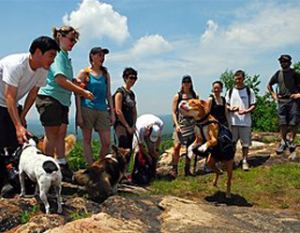 The two were among a pack of 13 humans and 6 dogs brought together for a hike at Harriman State Park, 45 miles north of New York City, by Leashes and Lovers, a social networking group to meet new people. If love or friendship was in the air, their dogs would sniff it out. Hotchkiss said she was not a social person, but that having her four-legged friend along made meeting new people less stressful because the emphasis was on sharing an activity both she and Jesse could enjoy. “I’m coming for her to be outdoors, and I’m just tagging along,” she explained. Leashes and Lovers is among a handful of social networking Web sites catering to dog-centric lifestyles, hoping to help the similarly minded connect for fun, friendship or romance. Rather than simply give dog lovers the virtual tools to meet online, Leashes and Lovers works to bring them together in the flesh — and the fur. The New York-based group has held swim meets, pub crawls and cocktail parties at some of Manhattan’s poshest nightclubs. Best of all, dogs are always invited on these outings, though not required. Some people with shy dogs bring photographs of them to share. The point is to be with people who won’t snicker when they tell you, for instance, that you grieved for weeks when your puppy died, said Sheryl Matthys, a former TV reporter who founded the company. “You really feel like you get to experience something special with your dog and other dog lovers,” she said. It was that idea of sharing a special experience that brought many of the people to the hike, and kept them going, even when the humidity left them sweating through their clothes and their dogs panting in chorus-like unison. Linda Biel, 44, of New York, said she had been to several dog lover events, including a scavenger hunt. Each time, Bolly, her Shetland sheepdog (named after the Bollinger brand of champagne) accompanied her. She said such events were equally fun for Bolly, who spent his time on the hike bounding up the trail ahead of the pack and then turning back and returning to Biel, who would then spurt water from a bottle into the dog’s mouth. “He’s herding,” Biel explained. She, too, said she wasn’t on the hike to find love. “The important thing is I’m doing something I like as opposed to an event that’s geared toward meeting people,” she said. Another potential problem: Single men rarely participate in such dog lover outings. Matthys said about 70 percent of people who go to Leashes and Lovers events are women. That would seem to bode well, statistically speaking, for men like Henry Lin, 44, one of the few men on the hike. He brought along his dog, Nala, a Shepherd Chow mix. He said events like the ones sponsored by Leashes and Lovers can help weed out mismatches. “There’s dog people and non-dog people,” he said. He knew this from experience. “I’ve gone on dates where I didn’t proceed because the women didn’t like the dogs,” said Lin, who said he had tried in vain to meet a romantic other during one of the events. Matthys, who also writes a column for the Web site under the nom-de-plume of The Dog Expert, said she does not know of anyone who has gone on to marry or develop significant relationships after meeting through Leashes and Lovers. She said two women who met through the company now celebrate their birthdays together. Connie Magee, the leader of the hike who founded Outdoor Bound, said the Leashes and Lovers hikers don’t kiss — or slobber — and tell. “We don’t ask,” she said. “But I do see lots of friendships formed, and lots of phone numbers and e-mails are exchanged.